How many times have you heard that from an athlete? Keeping score in a game is a form of feedback. Losing (achieving something that delivers negative feedback) feels bad. Winning (achieving something that delivers positive feedback) feels good. Why? Because it’s science, that’s why. The job of a youth coach is to help their athletes develop the skills, attitudes, and habits that will enable them to achieve success on and off the ice, field, or court. It’s a complex job, demanding a lot more than just ‘X and O’ sport knowledge, because coaches aren’t really coaching a sport, they’re coaching people. And when those people are only 6, or 10, or 14 years old, the complexity level shoots way up. The challenge for youth coaches is to help developing athletes reach for their highest potential as they navigate the path to becoming competent, confident, competitive, and resilient adults. In a sport sometimes criticized for being ‘old school’, continuing education programs provided by organizations like Hockey Canada and USA Hockey, and forums like The Coaches Site Conference are immensely valuable because they provide access to new thinking that can help coaches make a difference. From small area games to edge work and puck skills drills, from alternative zone entries to off ice fitness programs and helmet impact sensors, innovation is definitely part of the game now. 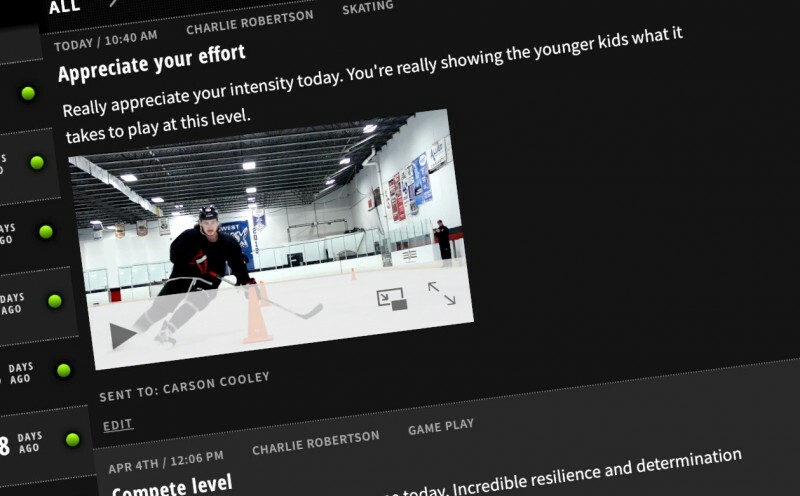 As the creators of PowerPlayer, we’re focused on innovating in a specific area: communication as a development tool, performance enhancer, and relationship builder. We believe that when it comes to feedback and athletic performance, frequency and positivity wins not only with young athletes, but also with their parents. For us — and for the organizations and coaches who are adopting our platform — positivity isn’t some new age ‘everyone gets a trophy because kids want to be coddled’ concept. It’s a teaching and coaching technique rooted in science. Positive feedback makes us feel good. But beyond the psychological impact, a number of studies by sports scientists have investigated whether or not positive or negative coach feedback might impact an athlete’s physiology and performance. In one study, a group of professional rugby players was shown game clips of their in-game successes with only positive coach commentary. Another group was shown clips with only their mistakes and critical coach commentary. A third group was given no video or commentary. All of the athletes were tested for free testosterone (the hormone that generates ‘compete level’ among other things) and cortisol (often referred to as the stress / fight or flight hormone) levels before and after exposure to the feedback protocols. And all were physically tested and had their game play performances ranked over time as the experiment continued. Basically, the study showed greater free testosterone and lower cortisol levels (that ratio is more likely to produce favorable athletic results) in the players who’d been exposed to positive feedback, and resulted in superior physical testing and game play ratings for the positive feedback group compared to the other two groups. The conclusion was that it was possible to positively influence the free hormonal state and game performance of athletes simply by providing positive coach feedback. Another study showed that athletes who received positive feedback combined with specific error cues and correction instruction (prescriptive feedback) developed skill confidence faster than athletes who received only prescriptive feedback. In other words, positivity wins. We suggest — and scientific evidence seems to confirm — that if coaches want to give players the best chance to become winners, it pays to remind them from time to time that they’re becoming winners. It makes sense to let athletes know that everyone’s personal development and learning process is continuous, that even seasoned professionals make mistakes and have bad days, and that as a coach you’re there for them. And of course it’s always a good idea to help them identify and understand specific ways to improve. The PowerPlayer platform is designed to make all of that easy. Positive coaching doesn’t mean shying away from pointing out areas for focus, or from helping athletes to understand and correct mistakes or change their behavior. It just means doing your best as their coach to always provide instruction in a positive context. It means remembering that the 6, 10, or 14 year olds we work with are still basically unformed blobs of swirling hormones (especially the 14 year olds!) and that our own actions as their teachers and advisors can tilt their internal scales from confident and motivated to anxious and discouraged pretty quickly. Want to help your players feel, act, and perform like winners? Remember that feedback is fuel. And that positive feedback is rocket fuel. Want to give your team the power of positive prescriptive feedback? Give us a buzz.